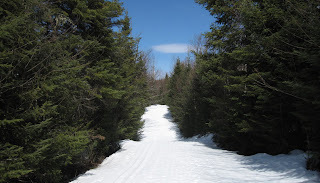 Adirondack Ski Report - Still Plenty of Snow in the Woods! For ye of little faith, here is photo evidence that I am still cross-country skiing, right out my back door. The picture was taken during yesterday's training ski at Mount Van Hoevenberg - skate technique was in order late in the day - yesterday, March 18, 2010! Photo courtesy of Joann Sandone Reed.